Customers can purchase easily editable policies, procedures and forms from Bizmanualz' popular titles such as Accounting, Finance, Computer & Network, Human Resources and Sales & Marketing. Bizmanualz, Inc., a business publications, training and consulting company based in St. Louis, MO, today announced the launch of a new website that offers instant download of prewritten policies and procedures. Customers can choose from hundreds of prewritten policies and procedures templates that are easily editable in Microsoft Word. The new website http://www.policiesandprocedures.com includes individual policy and procedure documents from a large selection of policies and procedures manuals offered by Bizmanualz. The website currently includes procedures from six manuals--Accounting, Finance, Human Resources, Sales & Marketing, Computer & IT, and ISO 22000 Food Safety. Bizmanualz will continually add more procedures from its titles in the coming weeks. As an added bonus, all buyers can download a free 16-page policies and procedures writing guide after completing their purchase. "Many visitors to our website were inquiring about the possibility of downloading individual procedures ala carte, because they didn't need the whole manual," explained Christopher Anderson, Managing Director of Bizmanualz. "Giving the customers what they want has always been our guiding philosophy and policiesandprocedures.com is an example of our customer-focused approach. Over the years, our policies, procedures and form manuals have helped thousands of companies improve their documentation and processes" Anderson added. Most downloadable policy-and-procedure documents on the new website also include forms and references. Pricing is based on the length of each procedure. Discounts are available for multiple purchases. As a launch promotion, Bizmanualz is offering a $10 discount for all purchases (no minimum) for the month of August, 2008. "Each policy and procedure document based on best practices is an excellent starting point in writing procedures for consistency, control and knowledge transfer," said Shailesh Panth, Director of Marketing at Bizmanualz. "Considering the time it takes to write an effective policy and procedure, the pre-written documents available at policiesandprocedures.com really provide excellent value for our customers." A free sample policy and procedure is available for download for those wishing to review the content, language and format of the documents available for sale. 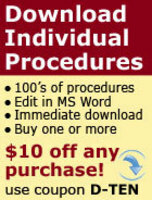 For more information, or to place an order, customers should visit http://www.policiesandprocedures.com. Bizmanualz also offers individual department manuals for: Accounting, Human Resources, Computers & Networks, ISO 9001 Quality, AS 9100, ISO 22000, Disaster Recovery, Sales & Marketing, and Security. All of Bizmanualz® policies and procedures manuals combine a printed version with easily editable MS-WORD documents on CD-ROM. Each manual provides pre-written policies, procedures and forms that enable executives to create and maintain internal controls for all departments in their business. They are available through the company's website, http://www.Bizmanualz.com. Retail, affiliate or dealer programs are also available.